Sightron just delivered to Jason Baney an SIII 6-24×50 Mildot, the latest in the new SIII line-up of side-focus, 30mm Sightron scopes. This follows on the hot-selling 8-32×56, which was the subject of our recent Scope Test. Jason will be testing the scope’s optical qualities soon and using it in an upcoming tactical match. 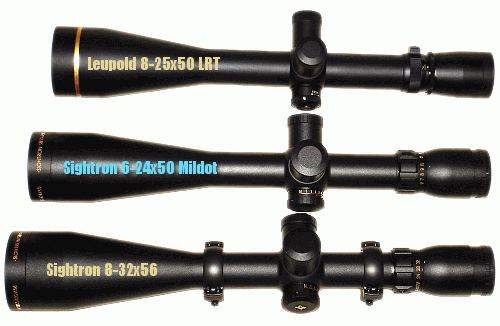 The new 6-24×50 scope is also offered with a fine cross-hair with target dot reticle. Both mildot and FCH versions are 14.96″ overall with a near-constant 3.6-3.8 inches of eye relief. Clicks are 1/4 MOA (15 MOA per revolution), and total elevation (and windage) adjustment is listed as 100 MOA (50 MOA on either side of center). That’s a class-leading amount of elevation which should make the new 6-24×50 popular with long-range shooters. 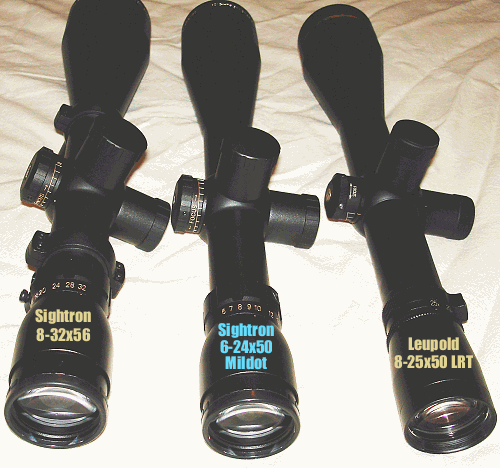 Shown above and below is the Sightron 6-24×50 Mildot, flanked by a Leupold 8-25×50 LRT and the Sightron 8-32×56. The controls on the 6-24 Sightron are identical to those of its big brother, but it is shorter, with a smaller objective. The shorter length and 50mm front objective allow a 2.8 ounce weight savings over the larger model (21.9 oz. vs. 24.7 oz.). Share the post "NEW Sightron 6-24×50 Mildot Scope"
Many of us F-class guys would like a 1/8 click scope for the new F-class target is hell!